Kissing the Leper: Do you know a nun? 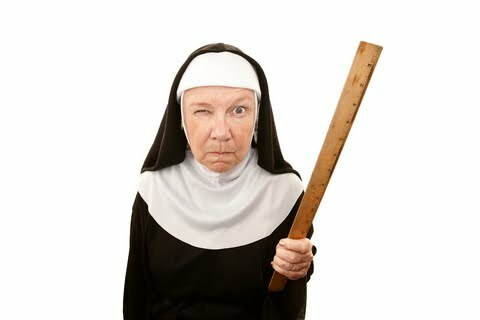 There is a lot of stuff in the news right now about nuns, most of it in the liberal press screaming that the Vatican is "cracking down" on American nuns. Let's chat about this. First, a little Nun 101. There are "nuns" and there are "sisters" and there is a difference. "Nuns" are actually women live a monastic life in a cloister. That is, they have limited contact with the world, and the focus of their vocation is prayer. A "sister" is a woman who - though she takes vows of poverty, chastity and obedience - lives "in the world". These are the women who teach, do social work, therapy, write blogs about media, etc. All this being said, most of us use the words "nuns" and "sisters" interchangeably, and while the distinction is great, no one gets too worked up if you call a nun a sister or vice versa. My point is this: do you know a nun (or a sister)? The press really likes to give us the image of the knuckle-cracking witch of old, floating up and down the aisles of the classroom in her bulky and mysterious habit, looking for wayward kids to whack with a ruler. If you know a nun, you know this isn't true. I happen to have deep, abiding friendships with several sisters. They are deeply religious women, highly-educated women, women of great faith and superior common sense. They make their livings in various ways, but all ways that serve the greater community in which they live, while living community life with the sisters of their order. I can say from my experience that these women have held me in times of great pain and sorrow, laughed with me in times of joy and helped me deepen my faith and the faith of my family in ways too numerous to state here. They are good women. And I imagine almost every woman who wears the label of "sister" or "nun" is a good woman, and the Vatican wants to ensure that doesn't change. 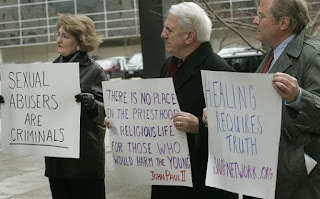 Don't let the press mislead you: the Vatican isn't out to crack down on nuns. The Vatican is ensuring that our sisters and nuns continue to lead lives of great faith, living as examples for the rest of us. I love my sisters who taught mme in the 50's. Some were pretty tough. At the time, I did not appreciate them. Please God, give us more sisters to teach in our Catholic schools. As a former (tough) Catholic school teacher, I think they are the best teachers! Wouldn't it be great if we had enough religious to teach in schools again?